These ancient ruins are considered the most important in Turkey. Leaving the colorful town of Izmir behind, you will pass through the verdant countryside before arriving at Ephesus. Once you enter the Open Air Archeological Museum of Ephesus and pass by the Magnesia gate, you will enter the administrative section of ancient Ephesus. The guided walking tour will take you through one of the most magnificent excavations in the world. See the Odeon, the Fountain of Trajan, the five terraces of the apartment houses, the steam baths of Scholastika, the temple of Hadrian and the impressive library of Celsius. The library is adorned with columns and statues. The Grand Theater, where St. Paul preached, is the largest theater in antiquity with a capacity of 24,000 seats. You will return to the motorcoaches through the Arcadian Way, where Mark Anthony and Cleopatra once rode in procession. 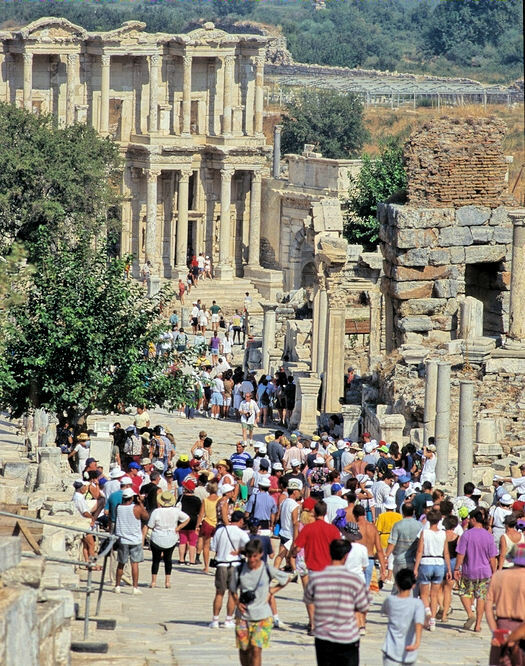 After the termination of the visit to Ephesus, your motorcoach will take you to your ship. There will be time for browsing and shopping once back in town. Excursions listed for a port may not be available for every cruise. A tour voucher is required for children age 6 and older. No charge for children 5 and under.